James Thompson is a civil rights attorney in Wichita, Kansas. He was a candidate for the Democratic Party for the 2017 special election held in the 4th Congressional District of Kansas, April 11, 2017. Thompson lost to Republican Ron Estes. He ran again in 2018. James Thompson's personal website claims that Thompson joined the Army after "[R]ising from homelessness in childhood," while The American Prospect claims that James Thompson "was briefly homeless as a teenager"). While in the Army, James Thompson served as a member of the Presidential Honor Guard. After his honorable discharge, he moved to Kansas to be close to family. He used the GI Bill to afford his education at Wichita State University and went on to earn his J.D. at Washburn Law. After graduation, he married Lisa Thompson, and is the father of Liberty Thompson. In 2009, a James Thompson signed a petition calling on President Barack Obama to Renegotiate NAFTA. The petition was initiated and circulated by Democratic Socialists of America. 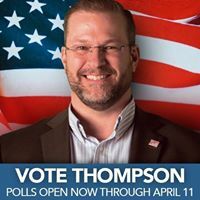 "Tuesday April 11 2017, James Thompson will be the first Democrat to test the political waters of a federal election since Donald Trump won the presidency five months ago. He is vying to represent Kansas’s Fourth Congressional District, a seat Representative Mike Pompeo held until Trump drafted him to head the CIA earlier this year. The seat has been in Republican hands for more than two decades, and Pompeo retained the seat by more than 30 points in each of the past three elections. Last November, Donald Trump defeated Hillary Clinton there by a 60 percent to 33 percent margin. It’s a deep red district in a deep red state, where the left has not challenged in years. "He believes that, for the first time in more than a decade, voters in Kansas have soured on the radical conservatism that swept Sam Brownback into the governor’s office and led the Sunflower State down a years-long path of aggressive tax cuts and far-right social policies. "But Thompson, a civil rights lawyer, exudes confidence. He believes that, for the first time in more than a decade, voters in Kansas have soured on the radical conservatism that swept Sam Brownback into the governor’s office and led the Sunflower State down a years-long path of aggressive tax cuts and far-right social policies. Thompson also sees a historically unpopular president and a vibrant grassroots effort to oppose Trump’s policies, led by the Indivisible groups and others, that have adopted his campaign as their first battle against the president and the Republican-controlled Congress. He says he can feel a shifting political wind at his back. "Just days before the election, Thompson had attracted more than 7,000 individual campaign donations. He says that as far as he can tell, that’s the most ever in a congressional race in Kansas, special election or otherwise. His opponent, the state’s Republican treasurer Ron Estes, has run a comparatively quiet campaign, skipping most debates and quietly picking up the expected endorsements—the NRA, Kansans for Life, and so on. "Thompson, by contrast, has been pitching his story to voters without pause. A few weeks ago, Thompson, backed by a wall of beer barrels at Central Standard Brewing, just east of Wichita's Old Town, was talking to prospective voters from the Young Professionals of Wichita. Wearing a cross-class combination of work boots, blue jeans, collared shirt and sport coat, his glasses and beard topping his stocky frame, Thompson delivered his origin story with a breezy, Midwestern bluntness: He grew up in Oklahoma City, at times in deep poverty. He was briefly homeless as a teenager, but went on to graduate high school and join the Army in pursuit of funding from the GI Bill that would help him afford college. "After he left the military in 1994, he moved to Wichita, where his grandparents live, and attended Wichita State University. "With just three months to campaign for the seat, Thompson settled on a platform that tugs from both sides of the state party—in part because it comes naturally to him, and in part because both pitches work in Kansas. He says he agrees with a lot of what Senator Bernie Sanders stands for—particularly his support for working people, better jobs and higher wages—and he has attracted Sanders supporters from the state’s major universities, who have staffed his phone banks and knocked on doors. James Thompson was inspired to run by Bernie Sanders. Thompson's campaign managers have been listed as Colin Curtis and Chris Pumpelly. Wichita Democratic Socialists of America very actively supported James Thompson's congressional races in 2017, and 2018. Our Field Director Rhonda Cox shows volunteer Logan and James the process for knocking. James Thompson was endorsed by Our Revolution. Members of the Wichita Democratic Socialists of America, public Facebook group, as of November 20, 2017 included Stephanie Yeager. She is a staffer for James Thompson for Congress. "I don't like the term socialist, because people do associate that with bad things in history," said Kansas congressional candidate James Thompson, who is endorsed by the DSA and campaigned alongside Sanders and Ocasio-Cortez, but is not a dues-paying democratic socialist. "There's definitely a lot of their policies that closely align with mine." Thompson, an Army veteran turned civil rights attorney, is running again after narrowly losing a special election last year to fill the seat vacated by Secretary of State Mike Pompeo. Even in deep-red Kansas, he embraces policies like "Medicare for all" and is openly critical of capitalism. Join us at 10am at the James Thompson Campaign Office to canvass before the primary August 7th! 555 N Woodlawn, Building 1, Suite 130 Wichita, KS 67208 (rear side of the building from Woodlawn, downstairs, look for the Thompson signs!). RSVP if you can! If you haven't canvassed before it's easy and they will train you! It's a great time to get involved! James Thompson, U.S. House, Kansas 4, was endorsed by Democracy for America in 2018. Vote Common Good 2018 endorsements included James Thompson. James Thompson KA 04 was endorsed by Justice Democrats for 2018. This page was last modified on 30 January 2019, at 02:05.